Congratulations to all those who successfully signed up! It’s been four exciting years of sharing my stories and thoughts with all of you, and I can’t put into words how thankful I am for having the sweetest and most sincere readers. September 24 is going to be incredibly fun, and we’ll definitely be bonding more this time over manicure sessions! Below is the final schedule for everyone’s reference. I took into consideration the preferred time slots you indicated in the registration form. My only request is that you all come on time to prevent delays, since Manos Nail Lounge can only accommodate 10 to 11 guests at a time. There will be desserts and snacks served as well! Plus—gift bags will be provided by our generous sponsors: Sleek MakeUP, K-Palette, Beauty Box Corp., and Celeteque. 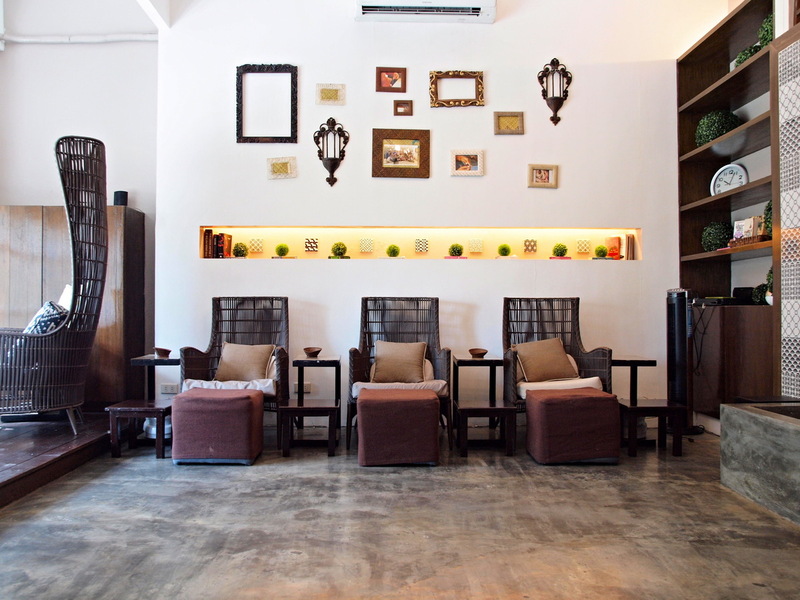 For those who aren’t familiar with Manos Nail Lounge, here’s the pin on Google Maps: https://goo.gl/maps/L3L2oRwmk432 Once you climb up the stairs of Crescent Park Residences (which is to the left side of the main entrance), Manos is located at the very end. A nearby landmark would be Burgos Circle in Bonifacio Global City. Let me know if you have any questions or concerns! Let’s take lots of photos and post them on Instagram! The official hashtag is #GretasJunkyardTurns4. To those who weren’t able to sign up, don’t be disheartened! I have a lot of exciting giveaways in store. Can’t wait to see everyone on September 24! Looking back at how much has happened in the last four years since I started Greta’s Junkyard, my heart can’t help but swell with so much love and happiness because what was once really just a creative outlet where I could keep writing as much as I wanted (while slowly climbing the corporate ladder from being a copywriter and marketing assistant, to a project manager, to a marketing manager, and now a managing editor), has grown to become a platform that has blessed me with so many opportunities. It’s become much bigger than how I had ever imagined and expected it to be—and it’s a huge bonus that through Greta’s Junkyard, I was able to meet the best and sweetest readers out there! 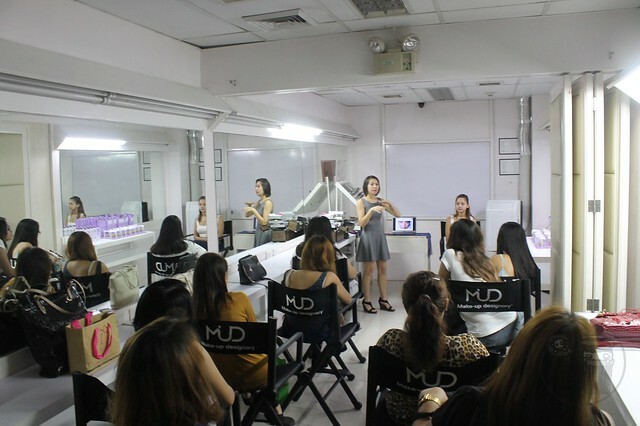 Two years ago, I decided to celebrate my blog’s 2nd anniversary by putting together a small makeup workshop at Purebeauty Serendra, where I taught my readers how to do a Day-to-Night makeup look. 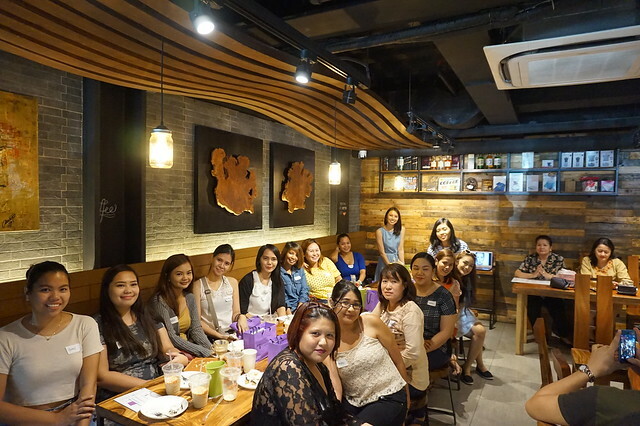 I could only accommodate 10 of you back then but it was generously supported by BYS Cosmetics, Eye of Horus, and Purebeauty. Last year, things leveled up a bit in terms of number of guests and the makeup workshop I gave—15 of you got to enjoy coffee, desserts, and a thorough session on how to contour and highlight according to your face shape! 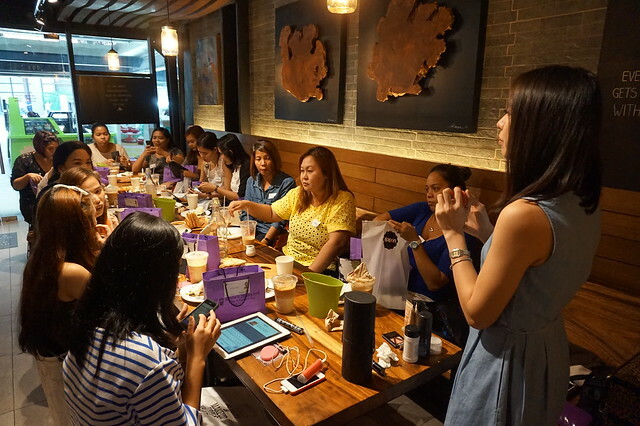 Maybelline, Nippon Esthetic, and GLAMGLOW sponsored some of the products that perfectly complemented the workshop. This year, I decided to do something a little different. 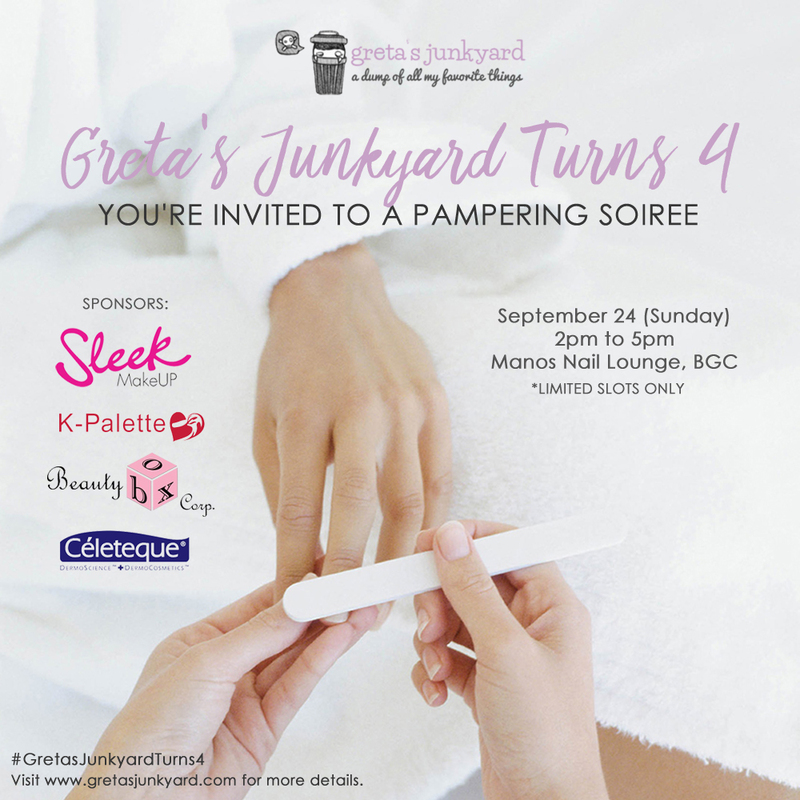 Instead of throwing another makeup workshop to celebrate Greta’s Junkyard’s 4th anniversary, I want us to bond and talk about all things beauty while getting our nails done! It will be held in my favorite nail spa, Manos Nail Lounge, on September 24, 2017 (Sunday) from 2pm to 5pm. But like the previous years, slots will be limited to the first 25 who will be able to register on September 15 (Friday) at 12pm. Be sure to set your alarms and bookmark this post, because I’ll be posting the link to the registration sheet here. As always, from the bottom of my heart, thank you for sticking with me these last four years. I can’t wait to see you all again on the 24th! Advance Happy 4th Anniversary! More years to come Ms Gretchen. Sept 24 is my brother’s bday, I think I can’t come as much as I love to met you. Thank you and more power. Hoping to see you again Ms. Gretchen! I Mizzed you Ms.Gretch! hoping to see you soon again ♥ ❤ ❥ Happy 4th Anniversary,More Power to your Blog! wiwit! Just saw myself on the first pic! Happy Blogiversary! Happy 4th year Ms Gretchen! Hugssss!!! Happy 4th Anniversary! Ms Gretchen..
More blessing to come and more power on your blog.. Happy 4th Anniversary, Miss! More blogs and blessings to come ❤️ Hope to be part of this celebration with my friend Cel Policarpio so we can finally meet you! Happy Anniversary Ms. Gretch! I may be new in reading blogs and following you on ur social media accounts. But nevertheless, Congrats on your 4th year of sharing your knowledge and passion. Hoping to meet you in person.